My inner 8-year-old-self geeked out when I was playing on Instagram the other day and came across these new kid shoes made by Fayvel. 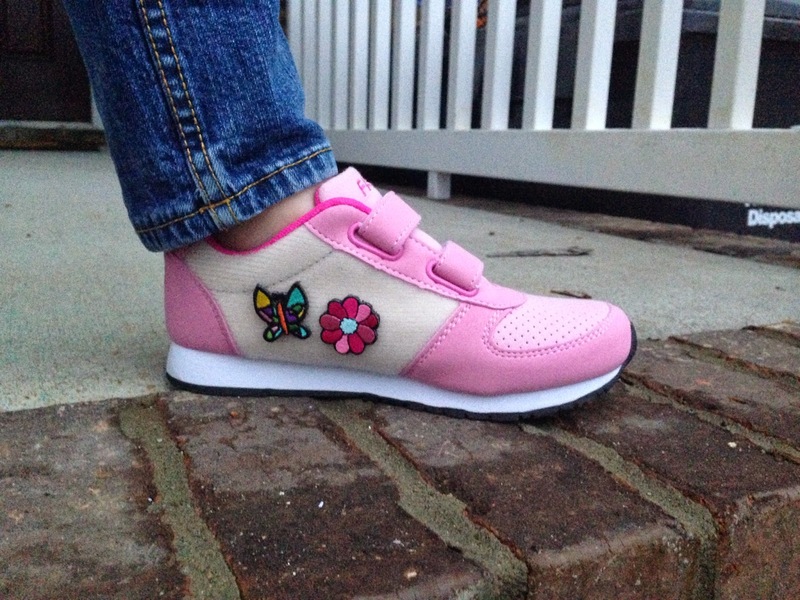 They are athletic shoes made for ages 3-9 that have plush fabric with velcro patches- Frieze Tags stick to so your child can accessorize to fit their mood or outfit! Currently, there are 13 limited edition Frieze Tag sets (4 patches) to choose from. The patches can be traded between friends or collected since they will change the designs frequently. Here are the first 10 designs- they have added Valentine’s as well as Winter Sports to the current list. They will release new tags during Fall 2015 and then will release more every season. I love that you can change the designs! The tag designs are children-inspired, hand-drawn and then embroidered with a strong velcro backing so they won’t fall off, but they aren’t hard to take off. We are pretty picky when it comes to shoes. We opt for eco-friendly materials or made without formaldehyde, and I prefer vegan. I often like shoe designs I see online, but they don’t fit my daughter correctly and they hurt her feet. So buying online without trying them on is tough for us. But I was excited to give Fayvel a try- especially since they are vegan and formaldehyde free- including the glues!! When they arrived, my daughter flipped out. She LOVED the shoe and the idea that she could decorate them however she wanted. She got the Fairies and Under the Sea Tags- which she will love wearing to the beach in a few weeks! She wore them to school and I was interested to see what she thought of them after having gym that day. When she got out of school she was bouncing off the walls telling me how these shoes made her run faster, jump higher, and they were the “best shoes ever!” Four days later and I can’t get her to take them off. Fayvel shoes are top quality shoes that aren’t just a novelty. They are great for active children and even have a a toe guard to protect their feet. Fayvel shoes are available with velcro or shoe strings in pink, purple, green, or blue in sizes 10-2. They will be making larger sizes (3-4) this summer! Fayvel shoes are $50, plus $12 per Frieze Tag pack. Totally worth every penny! Be sure to check out how Fayvel shoes got started on their webpage– I love their brand story!